Every kid dreams of a bunk bed. There’s something about a bed being at an elevated point that makes kids happy and eager to convince their parents to buy one for them. 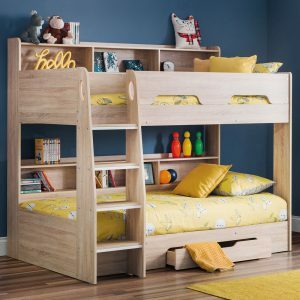 Kids bunk beds are practical if you need to make the most out of a small room. Its practicality lies in utilizing the floor space allowing you to sleep two or more kids in the same room freeing up space for storage and playing. If you’re in a position where you have to accommodate a girl and a boy in the same room there’s an option of picking gender neutral colours. Our beds come in white and wood finishes that are easily styled with accessories to identify with both of your children’s hobbies and interests. Neutral bed frames have a longer life span in particular when it comes to children’s growing and ever changing interests. One of the advantages of our beds is that you can always disassemble them and spray paint them in any colour of your children’s choice. 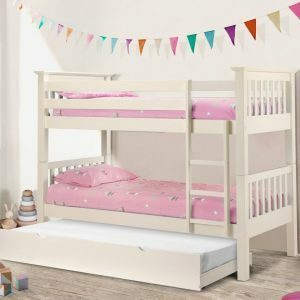 We offer bunk beds made out of both metal, wood and in some cases a combination of both. When you’re choosing whether a metal or wood bunk bed is best is due to your personal tastes because all of our beds come with the same safety guarantee. 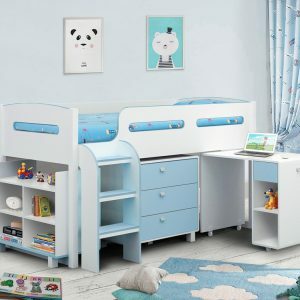 If you have to accommodate a boys' room we have boys bunk beds with storage and pull out drawers that are coloured in light or dark blues. 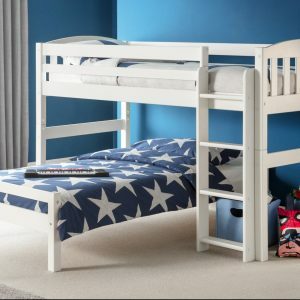 If your child is into superheroes and comics you’ll find it an easier decor solution to buy a bunk bed for boys with visual prints on it. This is practical if two are sharing the room with a small age gap so that they have similar interests. Visuals keep kids’ minds occupied making them feel connected to their personal space through their hobbies. 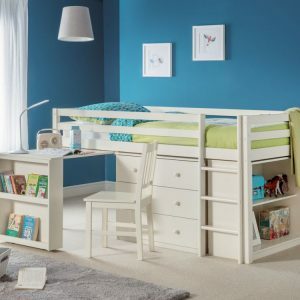 If you’re only accommodating one boy and you want a room where he will play, sleep and study (check out our Loft Beds and Study Beds) you might consider an option with a pull out desk that will slide underneath the bed. The pull out desk will make the room look tidier and allow for more floor space in case he invites his friends over to play. Transitioning a girl from their cot into a bigger girls bed can be done through a fun experience. A bed that has princess themed prints on it will make a girl look forward to changes in her sleeping routine. Curious how pink became a girl colour and blue a boy colour? Read The History Of Pink For Girls, Blue For Boys on Jezebel. We have girls bunk beds that have their own play area underneath with curtains for extra sense of privacy. This way she will feel like she has her own play fort. This area can be used to store toys and due to the curtains it will hide the mess making the room look tidy. Our beds let you customise small elements as the time goes on to maintain the excitement. Knobs and curtains can be updated in different colours to add more personality. Instead of building a custom made bed from scratch you can slightly customise it yourself. Designing a children’s bedroom is one of the most anticipated processes in an entire home involving lots of colour and patterns. There are a few elements you can add to the room to make it stimulating place for your kids. Wallpaper behind the bunk bed will add a pop of colour. This will be particularly stylish, sophisticated and fun if you choose a bed frame that is all one colour. If you are into a more personal approach you can commission a piece of wall art. Abstract shapes and watercolour wall art are very popular in children's rooms decor. Curtains for the beds can revolutionise the look of any bed and add cosiness. Adding them as an element to create privacy or as an interior design decor will result in kids looking forward to their bedtime by imitating feeling of a tree house. You can create bottom curtains or hang a dome curtain off the ceiling. Another way to make the bed look more interesting is to hang dome like draping. It is normally hung at the head of the bead which visually makes it look like a headboard. My girls have both said the bed and especially the mattresses are so comfortable and lovely to sleep on. We’re not in Dublin to take advantage of the assembly service so we got a local handyman to do the assembling for us. Overall very satisfied with the purchase. Thank you BunkBed.ie. Really strudy bed and great quality – couldn’t recommend this company enough and definitely suggest having the bed made by someone from here. We’re pleased with the quality of this product. The bed arrived when expected. The mattresses were thick and of high quality. The luminous strips on the steps were a nice touch. The bed is sturdy, there’s a good amount of storage under the bed and plenty of shelf space for books and toys.